According to a popular myth, long time ago lived a giant named Finn McCool on the shores of the county of Antrim in Ireland. On the opposite shores lived the Scottish giant Benandonner. One day Benandonner challenged McCool to a battle. McCool started to build a bridge, made of large columns of black rocks, to cross over the Irish Sea. Soon the bridge was completed and seeing his furious opponent approaching, Benandonner became afraid of the battle. So he asked advice to his wife. The wife responded “go hide in your bed and let me do the talking!” As McCool entered the castle, he asked astonished “who is this giant man snoring so loud in this bed?” The wife responded “Oh, it’s only our youngest, but my husband will be back soon. “ If this was the child, how big would be the father?! McCool started to run back to Ireland, destroying the bridge of columns behind him – so that’s why we today see ending the giant’s causeway in the middle of the sea. As charming this account is, it is probably not a true myth but a story told for the first tourists visiting the site, as there is no mention of it in historic documents or collections of Irish folklore. Today the legendary formation of the “Giant’s Causeway” is understood much better. When the Antrim basalt started to cool down the crystallizing rock contracted in volume, forming joints resembling a hexagonal pattern on the surface of the former lava flow. Fig.1. 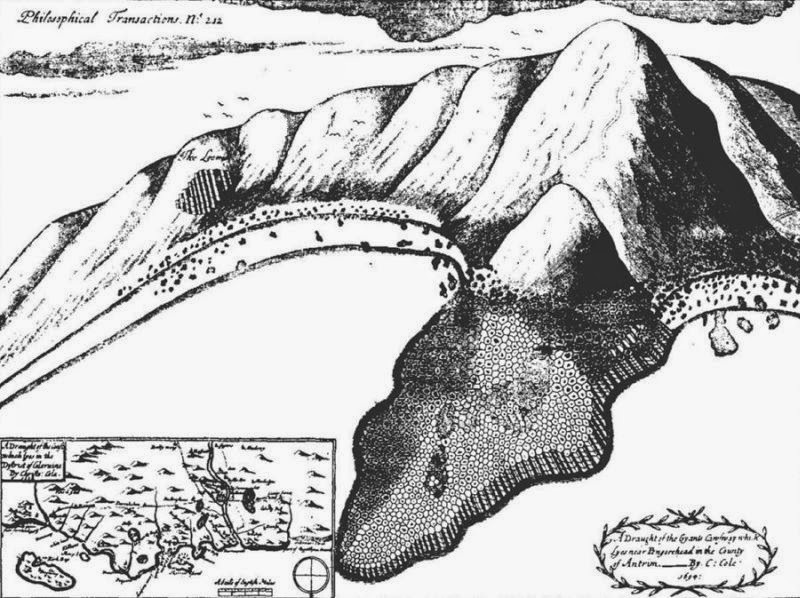 The first published image of the Giant’s Causeway by local artist Christopher Cole Foley was used to illustrate an account by Samuel Foley, Bishop of Down and Connor, in 1694. However both the drawing and the engraving from it were considered inadequate depictions of this peculiar Irish landscape. The Dublin Society decided to offer an award for the most realistic and scientific accurate illustration of the Giant’s Causeway. 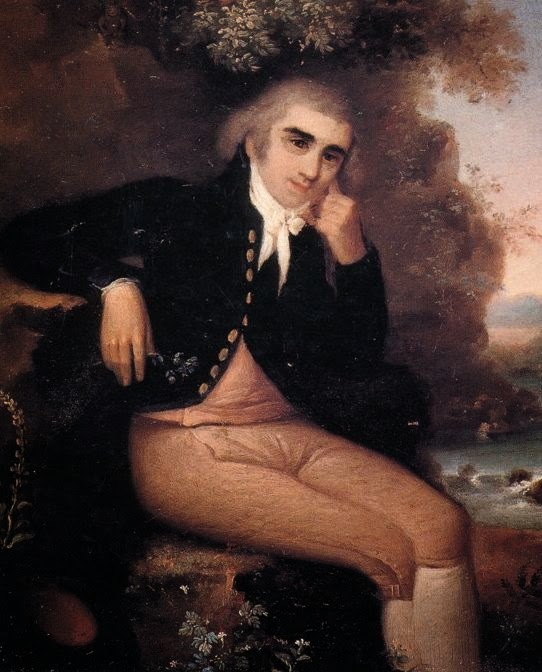 In 1740 the prize was won by Dublin artist Susanna Drury, who spent three months along the Irish coast to study the landscape and produce two paintings (a view from the east and a view from the west) of the Giant’s Causeway. These paintings were used as reference for various later engravings and illustrations and significantly increased the interest of the people in this geologic formation, today one of the most popular landscape in Northern Ireland and designated as World Heritage site by the UNESCO in 1986. Fig.2. 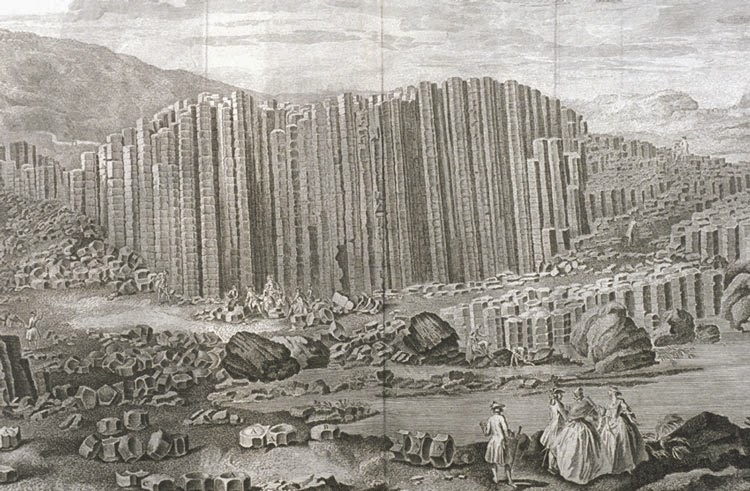 An engraving of 1768 based on the original painting by Susanna Drury “East Prospect of the Giant’s Causeway”. Rome, March 16, 1978 a car of the type Fiat 128 suddenly braked midst of the street, prompting the following cars to crash onto it. A series of shots from a machine-gun followed, killing all of the five bodyguards of Italian prime minister Aldo Moro. The prime minister was kidnapped, days later the first messages from the Brigate-Rosse, a terrorist-association active at the time in Italy, arrived, causing a severe political crisis as the government was insecure how to deal with the terrorists demands. Time passed, letters and messages were exchanged, when on May 8, an anonymous telephone-call signaled a parked car of the type Renault 4 in the center of Rome. Fig.1. 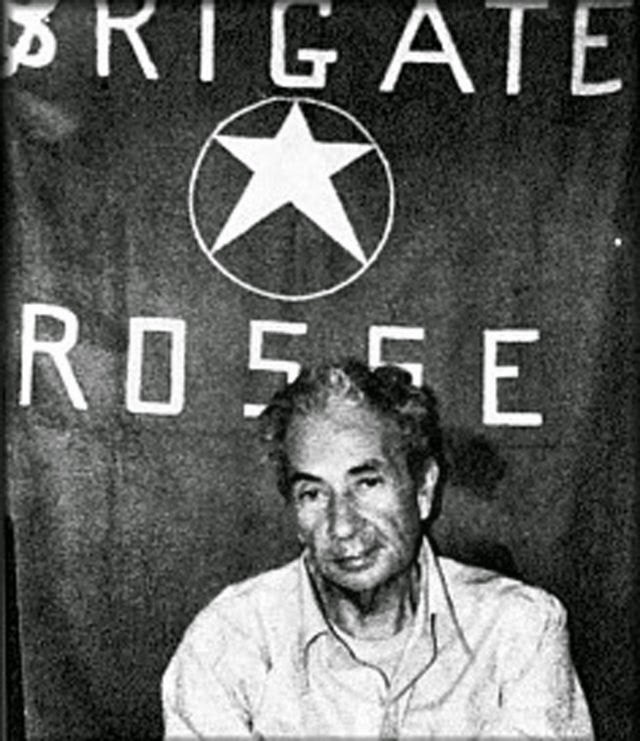 Moro, photographed during his kidnapping by the Red Brigades. Inside the car the Police found Aldo Moro, killed by a series of gunshots. Investigators immediately started to collect crime-scene evidence. During the autopsy small traces of sand were found inside Moro´s trouser cuffs, traces of geological material were also collected from the shoes and the trunk of the car, where the body was found. The forensic geologist had to answer two important questions: – could the geological evidence be tracked back to the site, where Moro was killed or his body dumped into the car? - could the geological evidence suggest an approximately time for when this happened? The chemical composition of the sand grains was analyzed, so to may be able to identify the rocks from where the grains eroded. The grain-shape and -size distribution could help to identify the depositional environment of the sand. All the sand, from Moro´s clothing as from the interior of the car, was identical, suggesting that the body was dumped into the car where Moro was killed or at least imprisoned. It was loose sand, without cement between the single grains (so it was clear that it was not derived from an older sandstone), of uniform grain-size, very well sorted. The grains where also smoothed and rounded by constant abrasion, like it happens by the constant motion of waves. It was so easy to identify the material as recent beach sand. This identification was supported by the presence of marine shells and microfossils. The remains of marine organisms, living in shallow water, suggested that Moro was killed or imprisoned during his last days somewhere along the coastline near Rome. The microfossils where identified as Miocene species, eroded from rock-outcrops not found along the coastline and transported by a river to the sea. This was an important discovery, as it suggested that the supposed crime-site was located near the delta of the river Tiber, the only river with a drainage basin where Miocene rocks were found. Also some grains of igneous rocks, recovered from the shoes, and eroded and transported from the volcanic hills surrounding the city of Rome, supported this hypothesis. Subsequent sampling showed that sand from an 11km long segment, situated north of the mouth of the Tiber, matched the sand found on Moro´s clothing. Fig.2. 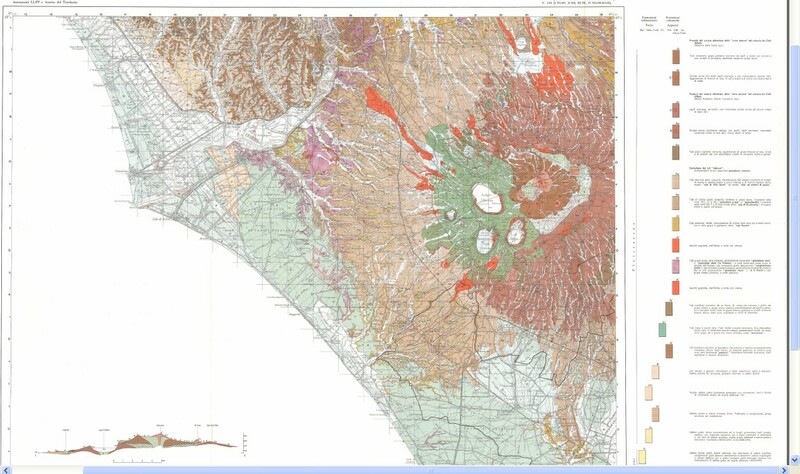 Geological map showing the Tiber-delta and the volcanic cones of the Alban Hills, from “Carta Geologica per servire alla storia dei Vulcani del Lazio del Prof. Giuseppe Ponzi” (1874), from the collection of the Italian Geological Service, published September 5, 2014 on the blog http://www.geoitaliani.it. The coastline of the Italian province of Latium is characterized by sedimentary rocks and recent river and marine deposits. The inland is formed by volcanic rocks, dated to the Pliocene. There were only few streets in this area and indeed traces of asphalt were found on the tires of the car. However more careful analysis reveled that the asphalt was of very poor quality and comparison with sand-samples revealed that it was in fact unrefined bitumen, derived from the pollution of a nearby oil-tanker terminal, washed ashore and mixed into the sand. Traces of this kind of bitumen were then found also inside the car, Moro´s kidnappers walked on the contaminated sand not long before the car was found, as the smears of bitumen were still fresh. This last observation suggested that Moro was killed shortly before the telephone-call and the discovery of the body. More close investigation showed that on the shoes, below the layer of beach sand, there was also a layer of volcanic soil. Applying the principle of sedimentary superposition (as the soil-layer is covered by the sand, it must be older), the forensic geologists suggested that Moro was imprisoned, before being relocated to the shore, somewhere inland, may south-east of Rome, where on easily erodible volcanic rocks clay-rich soils formed over time. Pollen grains supported this reconstruction, as the pollen in the soil came from Cypress and Hazel, blooming late in winter, but there was no trace of plants blooming in early spring (after March-April, so Moro the last weeks before his murder couldn´t been there). Only years later the investigators found an apartment, in the south-eastern suburbs of Rome, where Moro probably was hold captive for some time. The bodyguards were killed by a commando, hiding along the street where another terrorist blocked with his car Moro´s convoy. Moro was then kidnapped and hold captive for 55 days in the anonymous apartment near Rome, where he was finally forced into the trunk of the car and executed. The car was then parked in the center of Rome and a kidnapper called the police. But what about the found beach sand? The kidnappers claimed to have tried to mislead the investigators by faking evidence, pouring some saltwater and sand onto the victim and into the car. However to fake all the traces found on the car (especially the smears of bitumen) and on Moro´s shoes all those object had to be there on the shore – why such efforts to create evidence most people wouldn´t even realize exist? The supposed prison along the coastline was never found. Are the kidnappers with their misstatements hiding something, maybe a land property on the shore belonging to an important person? 100 years ago only segments of the coast and the approximately contours of Antarctica were known – a perfect scenario to be filled by the imagination of a writer. In 1888 the novel “A Strange Manuscript Found in a Copper Cylinder“, by Canadian James De Mille, was posthumously published (Brian Switek recovers these lost tales on his Dinosaur Tracking post “Who Wrote the First Dinosaur Novel?“). The novel narrates the adventures of a sailor shipwrecked on an unknown part of the continent, where volcanic activity enables a tropical lost world to flourish. Only in 1912, maybe also in response to the successful expeditions to the South Pole, Arthur Conan Doyle reinvented “The Lost World” in a remote region of the Amazonian forest. Curiously Edgar Rice Burroughs published in 1918 the first part of “The Land That Time Forgot“, maybe hoping to exploit the celebrity of Doyle’s tale. Here the primordial world populated by tropical forests and of course dinosaurs is located again near Antarctica on the island of Caprona, first reported by the (fictitious) Italian explorer Caproni in 1721. “At the Mountains of Madness” is a science-fiction/horror story by the American writer H. P. Lovecraft (1890-1937), written in February/March 1931 and originally published in the February, March and April 1936 issues of one of the first pulp-magazine of history: “Astounding Stories“. Lovecraft is today considered one of the first authors to mix elements of the classic gothic horror stories, mostly characterized by supernatural beings, with elements of modern science-fiction, were the threat to the protagonists results from natural enemies, life, but not as we know it. He was an enthusiastic autodidact in science and incorporates in his story many geologic observations made at the time, he even cites repeatedly the geological results of the 1928-30 expedition by explorer Richard Evelyn Byrd. Only in 1929-31 the British-Australian-New Zealand Antarctic Research Expedition was mapping the last unknown coastlines and still not much was known about the geology and palaeontology of the interior of the continent. In 1920 the geologist William Thomas Gordon described the oldest Antarctic fossils, archaeocyathids found in rocks dated to the Cambrian Period (more than 500 million years ago). Archaeocyathids, sponge-like organisms, were also discovered in samples coming from a moraine of Beardmore Glacier and collected in 1907-09 by Ernest Shackleton during his failed attempt to reach the South Pole. The desire to understand the ancient history of Antarctica had also a tragic consequence. December 14, 1911 Roald Amundsen and his team had reached the South Pole, four weeks later Robert Falcon Scott and his team sighted the tent with the Norwegian flag. This unexpected discovery demoralized Scott and his men who had also to face the impending polar winter and an insufficient stock of supplies. However Scott decided during his return to stop at a moraine and collected rock samples, loosing precious time and adding ulterior weight on the sleigh pulled by the men. The samples were discovered in 1912 along with the frozen bodies of the men. In 1914 British palaeontologist Albert Charles Seward described the fossil plant remains collected by Scott’s party as Glossopteris and Vertebraria, two species of plants distributed almost worldwide that will later be used by Alfred Wegener as evidence that Antarctica was once connected to the other continents. Lovecraft apparently was fascinated by the theory of continental drift as proposed by Wegener in the 1920s, as he describes the discovery of an ancient topographic map of unknown origin in a dead city, showing the slow movement of the continents on the surface of earth. For Lovecraft the geology and the detailed description of the discovered fossils is an essential part to present the idea of deep time, especially the pre-Cambrian, when according to the knowledge of his time no life existed on earth. However the expedition of Dyer discovers in rocks dated to this ancient period the traces of highly evolved creatures, referred only as the Elder Ones. They are far superior in their culture, technology and abilities to our civilization, most important they are immeasurable older than humans and Lovecraft’s tale ends with a warning: compared to the almost unimaginably vastness of the age of earth (and these creatures) we should feel quite humble (and afraid). Fig.2. Digital Elevation Model of the bedrock of the Antarctic continent, after data from LYTHE, M.B., VAUGHAN, D.G. and the BEDMAP Consortium (2000): A new ice thickness and subglacial topographic model of the Antarctic. 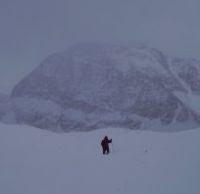 Today much more is known about the geology of Antarctica. The landmass of Antarctica is composed by two large blocks separated by the Transantarctic Mountains, a 2.800km long mountain range with 4.000m high peaks (Lovecraft´s imaginary Mountains of Madness were more than twice as high as these mountains). East Antarctica is dominated by Precambrian igneous and metamorphic rocks, however almost completely covered by a 4.000m thick ice cap. Even if East Antarctica is thought to be an ancient and stable continental shield, geophysical investigations showed prominent mountains buried under the ice, like the Gamburtsev Mountain Range, a 1000km long mountain range with peaks almost 3.000m high. The origin of these mountains was for a long time an intriguing mystery – volcanic origin, mountains formed by subduction very recently or the remains of an ancient Gondwanan-orogeny were the most popular hypotheses. Most recent research (FERRACCIOLI et al. 2011) proposes that these mountains are much elder ones, formed by movements during the collision of the various blocks. West Antarctica is a mosaic of five smaller blocks covered by the West Antarctic Ice Sheet; however rocks are exposed on the Antarctic Peninsula. The Antarctic Peninsula was formed by uplift and metamorphism of sea-bed sediments during the late Paleozoic and the early Mesozoic, as proved by the fossils that inspired Lovecraft. "He was painter, and he used his art to vividly depict his own concepts. So he depicts on the frontispiece the spirit of observation who, climbing on a mountain on which ground are spread marine bodies, shows one of those to a somehow surprised ghost, emerging from the mist, which seems not able to believe his own eyes." Brocchi (1814) describing the work of his predecessor, artist and naturalist Agostino Scilla. 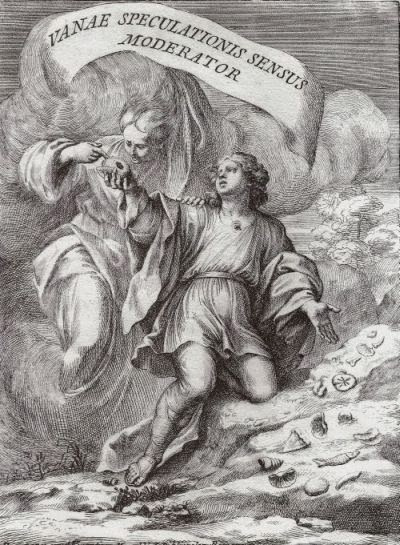 Scilla in 1670 published “La vana speculazione disingannata dal senso”, where he argued that fossils are the petrified remains of once living beeings and one simply had to observe the similarities between the fossils and recent marine organisms in the field, instead of vain philosophising, to recognize this simple truth. Fig.1. "Vanae Speculationis Sensus Moderator", a later published (1752) Latin edition of Scilla´s work. Italian mineralogist Gian Battista Brocchi (1772-1826) may not well known nowadays, but as both Charles Lyell as Charles R. Darwin were influenced by his works, he significantly contributed to forge modern geology. He studied jurisprudence and theology in the Italian town of Padua, but soon became interested in geology, mineralogy, botany and zoology and will frequently combine or even merge his various interests. Brocchi, who studied also ancient Egyptian art, argued that certain cultural phases and art-styles first appeared in a rudimentary form, developed over time to become more elaborated and finally would become obsolete and replaced by other, more modern, art-styles. Strongly influenced by this observation he applied a similar approach to botany and zoology, where he compared recent species with fossil ones, noting that similar to cultural phases, also species can become extinct and are replaced over time by new ones. 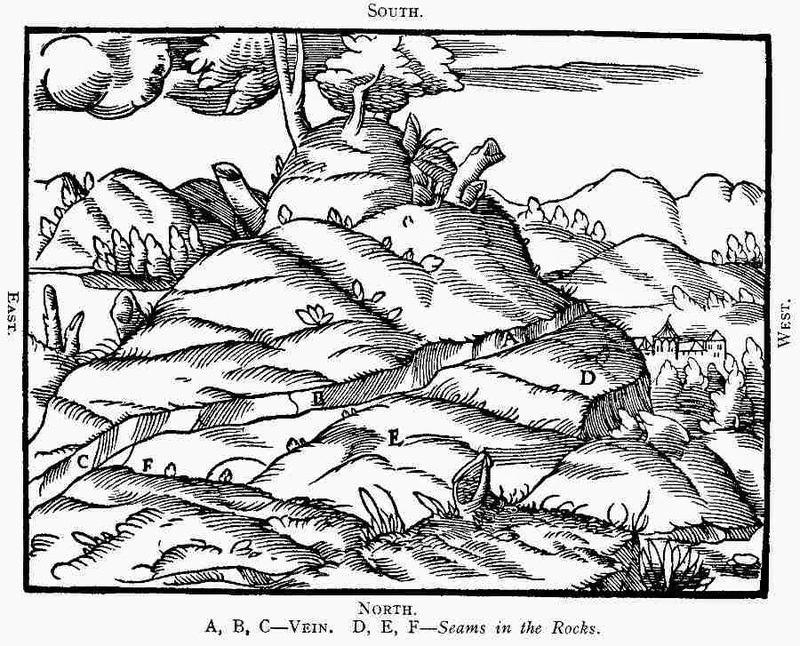 Also in the mineral kingdom he observed an “evolution” of minerals over time, even more curious, he argued on a sort of “descend with modification”. 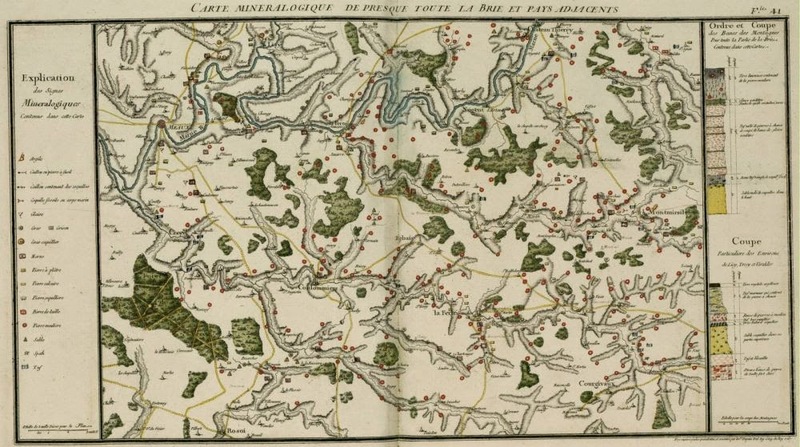 In his "Trattato mineralogico e chimico sulle miniere del Dipartimento del Mella" (1807-1808) he explained the great varieties of minerals as derived from a set of more simple rocks - as he states - “evolved” slowly over time according to natural laws acting now as in the past (it´s not a coincidence that such ideas sound similar to Lyell´s later uniformitarianism). 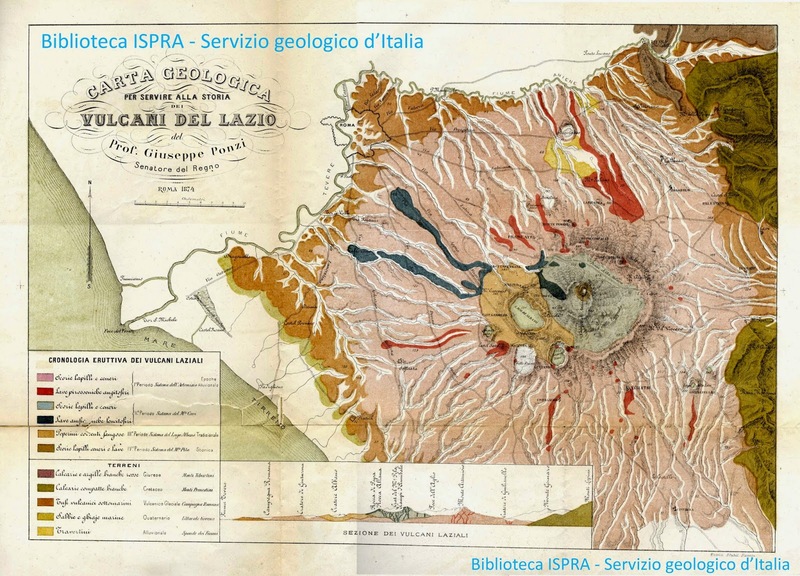 His observations and research as inspector of mines in the recently established (1805-1814) kingdom of Italy was published in 1814 in the two volumes of “Subapennine Fossil Conchology”, where he also resumes all his geological as paleontological speculations. Fig.2. A somehow thoughtful Brocchi on the frontispiece of his book "Chonchiologia Fossile Subapennina con Osservazioni Geologiche sugli Apennini e sul suolo adiacente” (1814). Volume one is an introduction, discussing stratigraphic as geological problems, volume 2 deals with the classification, description and distribution of Italian fossils found in Tertiary strata. Brocchi showed that different strata can be distinguished by the different species-assemblages, where the found fossil species become more and more similar to recent species as younger is the studied strata. 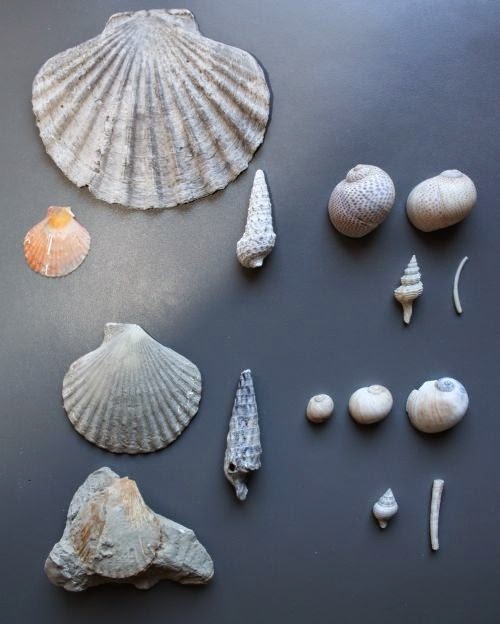 Scottish geologist Charles Lyell, who was fluent in Italian and surely know of Brocchi´s work, will use the classification and distribution of fossil molluscs to define the geological epochs of the /former) Tertiary period. For Brocchi only the extinction of species and birth of new ones could explain the stratigraphic order he had observed. Fig.3. Fossil shells (bottom, Pliocene-Pleistocene) showing already some striking similarities to recent (top) shells of marine snails and bivavlves found along the Adriatic coast. Brocchi and later Lyell observed that with decreasing age of the geological strata more and more "recent" molluscs appeared in the sediments. Unlike other contemporary naturalists like Comte de Buffon (1707-1788) and Georges Cuvier (1769-1832), Brocchi didn´t consider an external force (or catastrophes) necessary or responsible for the disappearance of a species from the geological record. Like a single human life or an entire culture, also a species would appear, evolve and thrive, but in the end vanish and disappear – it was inevitable and only a matter of time. Mammal species, appearing and disappearing quickly in the geological record, had a short “species-life”-expectancy. Molluscs, known for their longevity and also based on the observed stratigraphic range, had a longer life-expectancy and therefore slower faunal turnover. Brocchi surely know of Lamarck´s work on the fossil molluscs (completed in 1809) of the stratigraphic succession in the basin of Paris. Lamarck also subdivided geological strata based on fossil molluscs assemblages, but more important was an eager promoter of “variable species”. However from the contemporary reactions it seems that Lamarck´s s work was not well received. 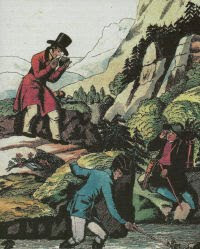 Lyell dedicated an entire volume of his "Principles of Geology" (1830) to rebut Lamarck´s hypothesis on transmuting species and Darwin considered the entire work of the French naturalist as "useless". Brocchi in contrast was at the time one of the few international recognized Italian naturalists and both Lyell´s uniformitarianism as the subdivision of the former Tertiary are based in part on Brocchi´s geological work. 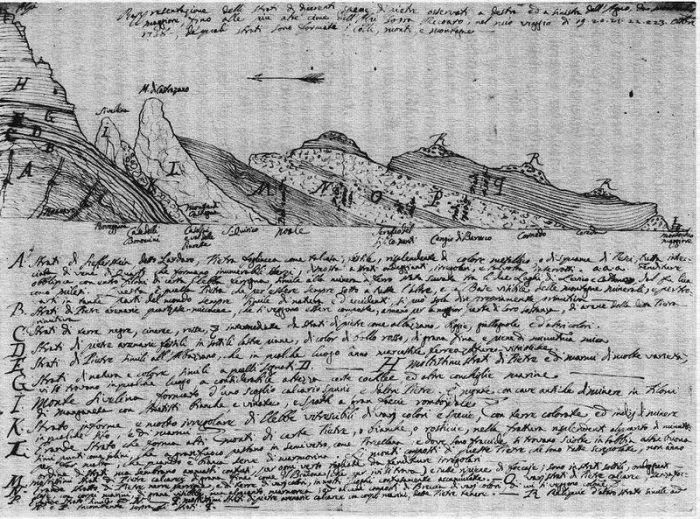 We know for sure that Darwin was strongly influenced by Lyell´s work and so surely came in contact with Brocchi´s geological ideas. Also some of Brocchi´s works on species evolution were translated into English and were probably discussed in lectures or in private meetings by the former teachers (like mineralogist Robert Jameson) of young Darwin. Darwin during his voyage on the Beagle (1831-1836) wondered if species may die and are reborn in a discontinuous natural process. Observing fossils similar to bones of the modern Mara (Dolichotis patagonum), a South American rodent that resembles a small deer, Darwin realized that species were replaced in time by similar forms. However the young Darwin didn´t yet consider a gradual transition of one species into another possible, as he frequently refers to the observed animals as “individual species” and distinct entities in time. Only some time later, influenced by Lyell´s uniformitarianism, he will publish a more gradual model, where evolution doesn´t occur in jumps (as may suggested by Brocchi) but by slow and gradual evolution of populations. The distinct stratigraphic differences in species assemblages and the sharp limits between those, as used by Brocchi and Lyell to distinguish geological epochs, were for Darwin more an artifact caused by the"imperfection of the geological record" than by a supposed limited life-expectancy of a species. Species went extinct not for an organism-intern property, but simply because some species, by chance better suited to exploit the limited resources, would better survive and generate more offsprings and so over time replace less adapted species. The Geology of Star Trek: II. It is not Life as we know or understand it! It may surprise that there is no exact definition of what “life” is - it is often described as a system in thermodynamic disequilibrium with it´s own environment and therefore forced to actively seek, incorporate and transform matter and energy. Part of the acquired energy and matter is used by this system to create copies of itself and so to survive it´s own death. Some of these properties are however shared also by inorganic entities, like the order, growth or twinning of crystals, and a virus can´t grow or replicate without infecting a living cell. Living bacteria were found in boreholes in 5.278 m depth, on the bottom of oceans, acid and toxic lakes, in hot springs with temperatures of 115°C and in rocks of Antarctica, thriving at -50°C. Part of this success is explained by the molecular structure of these life forms, as carbon-based molecules are stable in a wide range of temperatures and in acid or basic solutions. 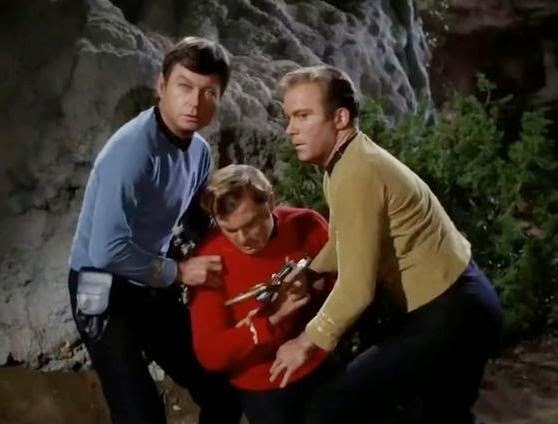 However when the crew of the Enterprise is contacted in the episode “The Devil in the Dark” by the miners on Janus VI, supposedly attacked by an unstoppable “monster”, soon this fact is questioned. The creature can´t be tracked by the sensors of the Enterprise, nor by the tricorder and seems immune to direct hits with the phasers. In theory, silicon could form polymers and complex compounds together with metals or elements like boron, nitrogen, phosphorus and sulfur (in fact almost all known minerals involve silicon). Such molecules could work also in other liquids than water, liquids like liquid nitrogen, methane, ammonium, various alcohols and even acid solutions. The Horta, as the mysterious native life form of Janus VI refers to itself, defends itself and digs tunnels in solid rock using a strong acid. It´s curious to note that certain acids, like sulfuric and hydrocyanic acid could act as solutions for an extraterrestrial metabolism. However silicon as replacement to carbon has also it´s disadvantages. Complex silicon compounds are unstable and ineffective under terrestrial conditions. McCoy notes this, claiming that silicon life would not survive in the artificial (?) human environment created on Janus VI. But as it seems the creature called Horta comes from within the planet, where may suitable conditions exist. Silicon life forms may could exist in oxygen-free or poor (as oxygen would oxides the silicon molecules), dry and very cold environments. Such for humans highly prohibitive conditions would also reduce the metabolism and reproduction rate of this hypothetical life form, may we would not even realize that it is alive. 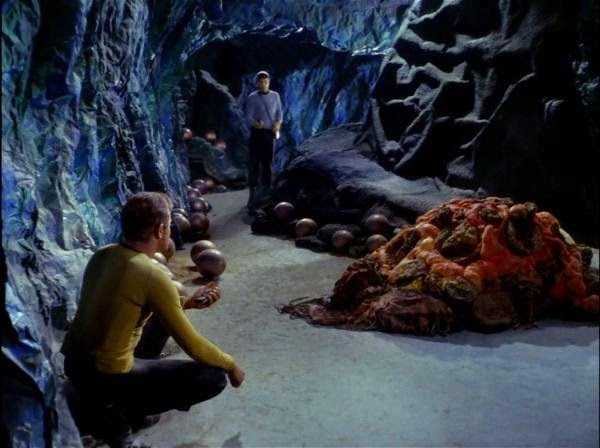 In the Star Trek episode the Horta is the last of it´s kind, only the eggs – appearing to us like inanimate silicon-concretions - survive, however needing thousands of years to develop and be finally ready to hatch. 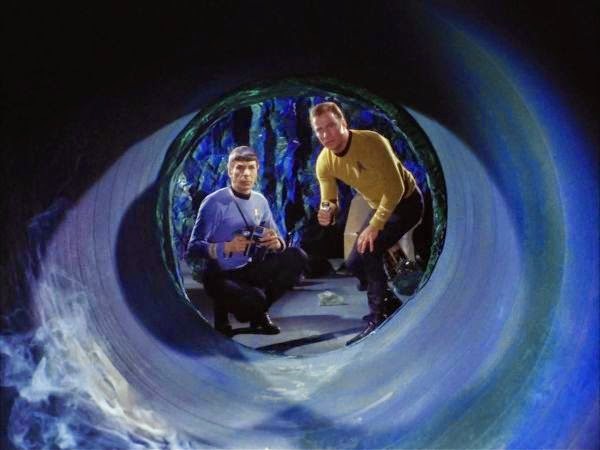 One of the great strengths of Star Trek was to pose both ethic as intriguing scientific questions, may some will be answered by future generations, when they one day may really encounter life, but not as we know it ... I find that a fascinating vision for the future! Geologists get no respect, even if vital for entire civilizations, from the episode “The Devil in the Dark”. According to Vulcan philosophy one should respond with grief only if a life was lost in vain. The loss of Mister Spock - more precisely of actor Leonard Nimoy – last week was followed by worldwide reactions, remembering him both in his role as a real person. I think Nimoy would have liked it, as it obviously shows that he left a lasting impression on our pop-culture. So here is my geological-geeky tribute to his impersonation of the 1th science(including geology) - officer on board of the USS Enterprise and the geology of the Star Trek universe. Geologists seem to be a quite common race in the Star Trek universe. According to "Star Trek - Enterprise" (and alluded in the movie "Star Trek: First Contact") one of the first contacts of humans with an alien species occurred when the crew of a geological exploration mission crash-landed on earth and was forced to work in a coal mine in Pennsylvania. This seems logical. Mining activities for raw materials and fuel are also widespread in the Star Trek universe. As every space-civilization would soon or later exhaust the resources of its own planet, there is an urgent need for specialists of extraplanetary geology. Subterranean mining facility on Janus VI, essential for providing thousands of worlds with metals and other precious resources. 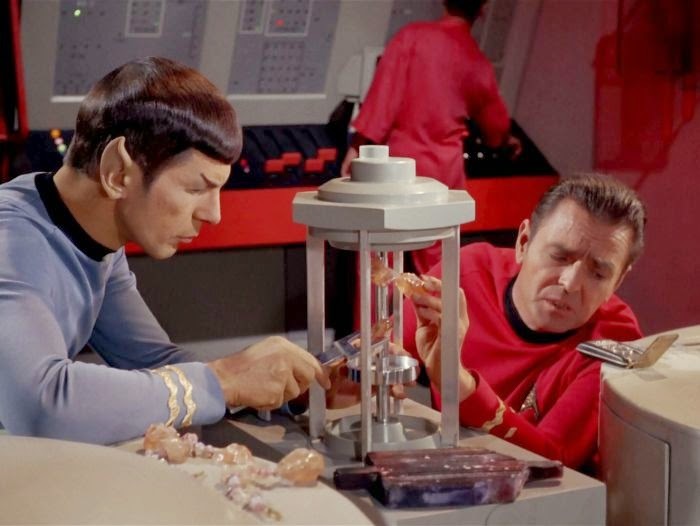 In many episodes of the original Star Trek series the crew of the Enterprise visits mining-colonies on foreign planets or searches for valuable minerals and crystals, there is even a geological tricorder available and how I did love to be able to access the mineralogical database in it. By convention the names of terrestrial minerals (a crystalline combination of one or various elements) end with the suffix "-ite", the denominations of elements with the suffix "- ium", "-um", "-on", "-gen" or "-ine". Unfortunately it seems that this nomenclature is not always applied with the necessary scientific accuracy by the Enterprise crew, but as those are (to us) unknown materials, it may be excused. Unknown elements, forming also unknown minerals, are not a scientific impossibility. The heaviest elements human science knows posses an atomic weight of 118. These elements are unstable and radioactive. However it may be possible that still unknown elements with an atomic weight, higher than 184, are stable and exist somewhere out there. Could these unknown elements form also minerals? 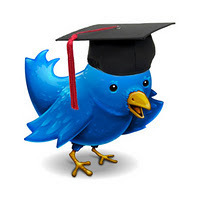 Without facts it is vain to speculate. In meteorites we have found almost 300 different minerals, based on known elements, however formed under extraterrestrial conditions and therefore not found in earth´s environments. Iron-, magnesium-, calcium-silicates prevail, but also iron- and nickel-alloys, maybe forming also earth´s inner core but unknown on it´s surface. More than 125 minerals are mentioned in the original Star Trek episodes, movies, animation series and the recent TV-reboots, however of these only 23 are actually real terrestrial minerals and only one mineral - olivine - has actually been found in extraterrestrial rocks. Curiously quartz, one of the most common minerals on earth, is almost never mentioned but specimens are used as props for dilithium crystals. In the Star Trek universe lithium or dilithium (spelling used in later episodes) is the only material that can be used in matter-antimatter reactors, standard equipment on board of federation spaceships. As its (supposedly) cubic crystal structure can filtrate antimatter it therefore can be used to control the energy output from the reactor. As some real minerals can filtrate or distort certain wavelengths of visibile light, it may be not a so far-fetched physical property after all. Gemstones like sapphires, diamonds, emeralds or rubies, all these crystalline forms have a great appeal to humans, but are just carbon, aluminium or silicon-oxide varieties ... quite illogical (from the episode “Cat´s Paw”). 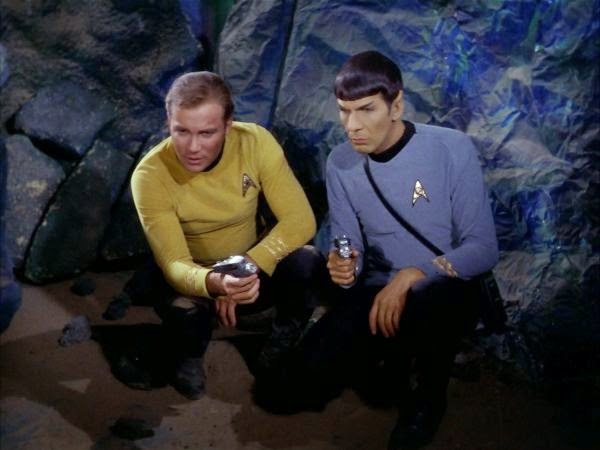 Common salt plays an important role in the episode "The Man Trap" (it was also the first episode of Star Trek ever broadcasted, as the other episodes were rejected at first. In the original pilot episode, "The Cage", however there features also a geologist and a geological report). A remote outpost is infiltrated by a shapeshifting creature. Only using some halite (the mineralogical term for salt) as bait, the creature, in desperate need to feed on this mineral, will reveal it´s true form. Sulfur, saltpeter and carbon (in two crystalline modifications, as coal and as diamond) saved Captain Kirk´s life in the episode "Arena". 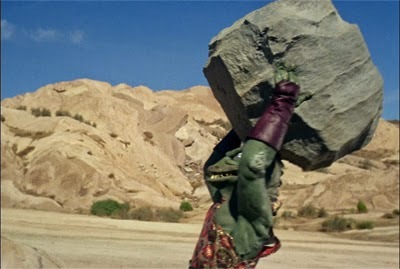 Kirk is forced into a battle against the almost indistructible Gorn, a reptilian life form with armored skin. 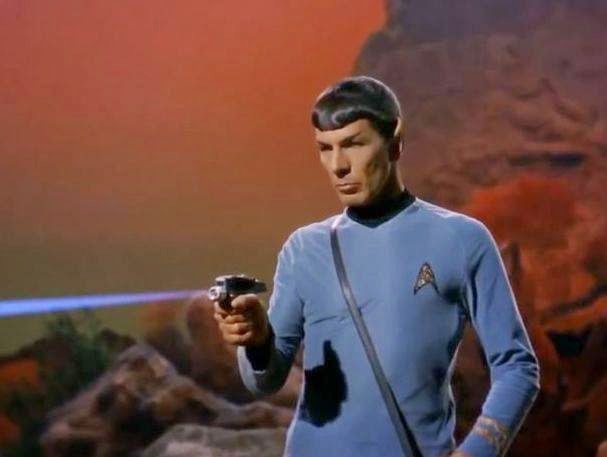 Only by using the naturally occurring outcrops of the mentioned elements and minerals on a desolate planetoid, Kirk is able to build a primitive gun. Using the sulfur, saltpeter and coal to make gunpowder and the pointy diamond-crystals as high-impact projectiles, he finally puts down his adversary for good (unfortunately the supposed "diamonds" have the wrong crystal shape). It´s curious to note that hand lens or geological hammers are of no use in the 23th century. 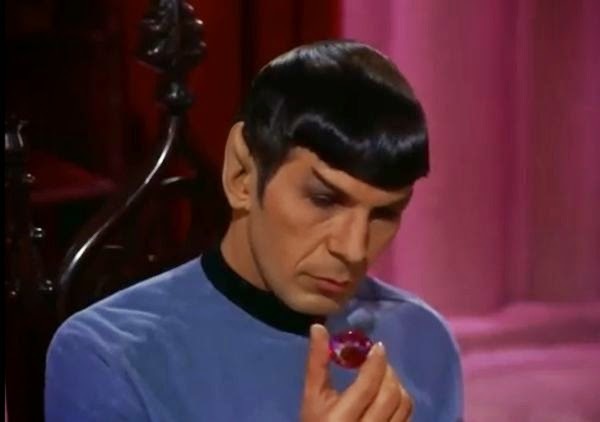 In the episode "Obsession" Spock analyzes a rock composed of the mineral tritanium with the already mentioned tricorder. 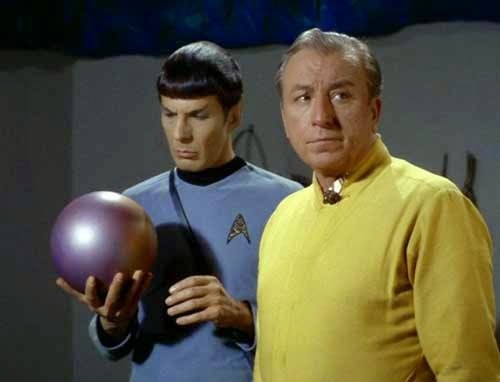 Tritanium is 21.4 times as hard as diamond (curiously Kirk in the episode "Arena" states that diamonds are the hardest substance known in the Star Trek universe!? ), therefore useful for the construction of indistructible spaceship hulls (which begs the question what phenomenon could erode and smooth the boulders found on the surface of Argus X). The rock can be sampled only by phasering off a piece, since it is too hard to cut with normal tools. 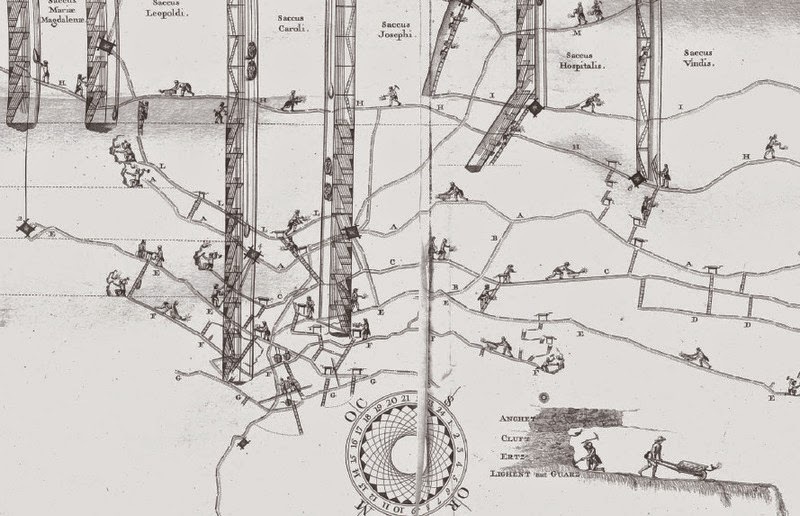 However even the most sophisticated technology can´t replace geological intuition - It is not logical, but is often true. On Gamma Trianguli VI (episode “The Apple”) Spock immediately notes the lush vegetation, deducing correctly that also soil-nutrients and therefore geology plays a role in supporting this peculiar paradise-like world. With his sharp geological eye Spock identifies also hornblende and quartz in a rock (according to petrological composition may an igneous rock? ), easily erodible (and explosive!) and so may the source of the rich soil.